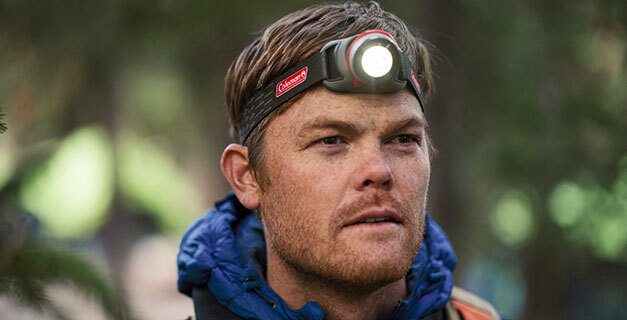 The Coleman® BatteryGuard™ range of headlamps are designed with simplicity in mind; the headband, made from a soft, lightweight and breathable fabric and fitted with an easy-tug buckle, ensures a snug fit on the forehead; The head of the light has a pivot that can be adjusted to your desired angle. The BatteryGuard™ function which is integrated with the light switch extends battery life by protecting against corrosion and battery drain. They’re light, compact, user friendly, sleek and just what you need for a late night run. With its long run time, it is practical for outdoor activities like camping or trekking, or for travelling, and also for daily activities and projects around the house. Retain your battery life until it’s required with the breakthrough BatteryGuard™ technology! BatteryGuard™ technology disengages the battery from the electric contacts with a single slide movement. Once the electric light has been switched off, you are sure to prevent battery loss. In addition to saving your batteries for times of need, the disengagement of the battery compartment means that your batteries won’t leak acid or erode inside the light. Not only does this protect your Coleman® light, but also provides an extra level of safety for the user — the light is there when you need it. Easy to use, designed to get the most out of your electric lights and smart in engaging the batteries' power - BatteryGuard™ makes it all possible!